Richell Playpen - Why Its An Excellent Multipurpose Affordable Playpen? Richell Playpen – why it is an excellent multipurpose affordable playpen? Richell Playpen serves three functions in one. It is an excellent high quality, durable playpen and I highly recommend it to you. But, do not buy it till you look at the pros and cons, and find out know why this maybe a good playpen for your pet. Also, you will find below a comparison with a competitors product. Having your puppy or cat run around all day in your home might be fun to watch, but it poses several safety hazards for you and your pet. At the same time there is high chance of some mess. This is why playpens are predominantly used in houses that have pets. 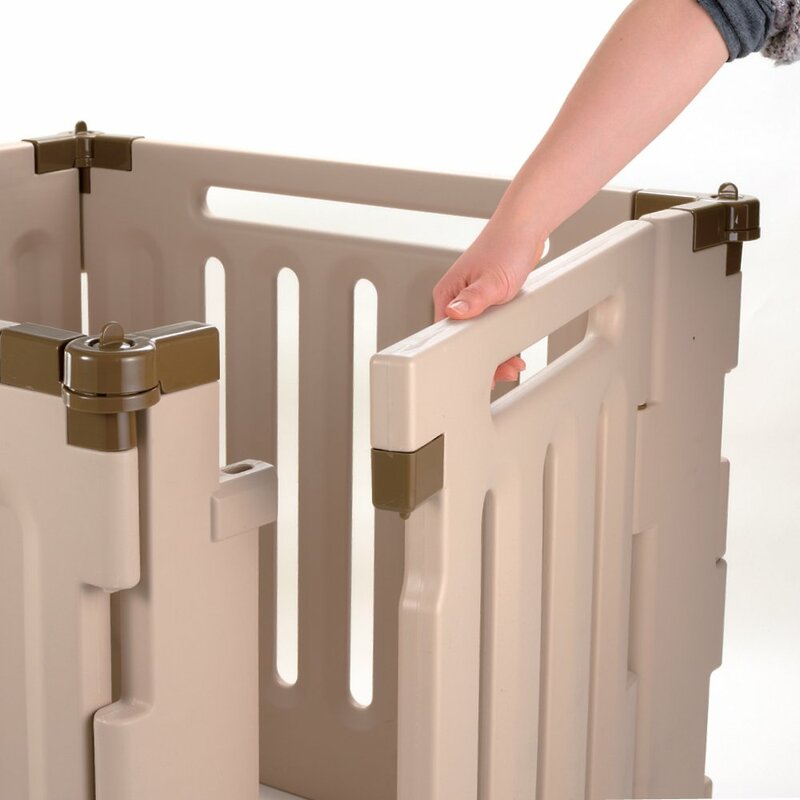 Richell Playpen will provide a secure area for your pet to run around, rest or sleep. You don’t have to worry about them breaking anything or getting lost in your home anymore. 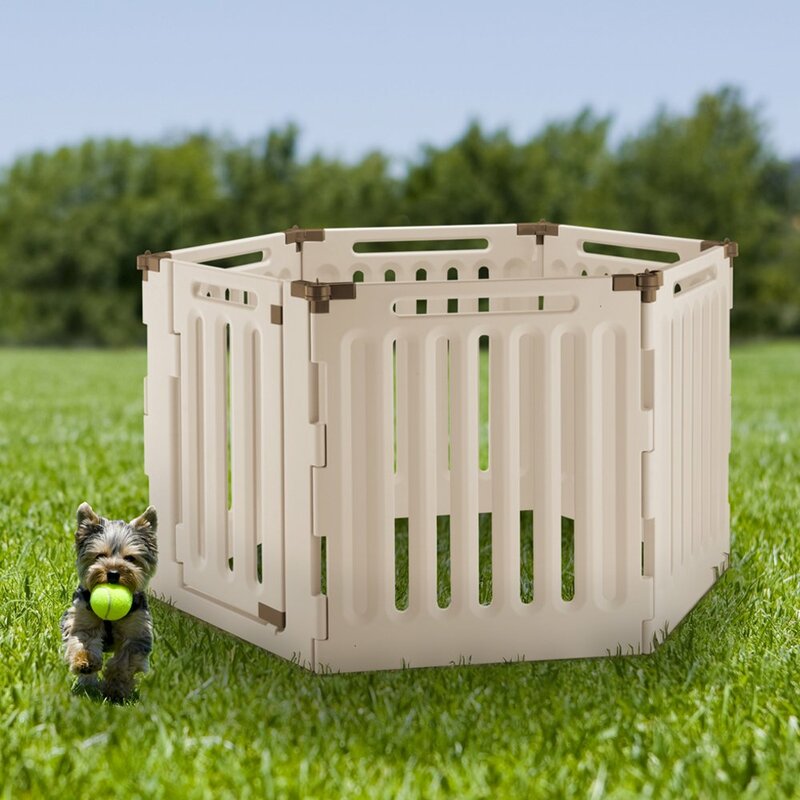 Richell Playpen (Convertible) is made of high-quality sturdy material so it can withstand fair bit of bites or scratches, which is a normal part of a dog’s life-style, right. What Makes Richell Playpen Different? Now you may wonder how a playpen can be any different, it’s essentially a playpen, right? 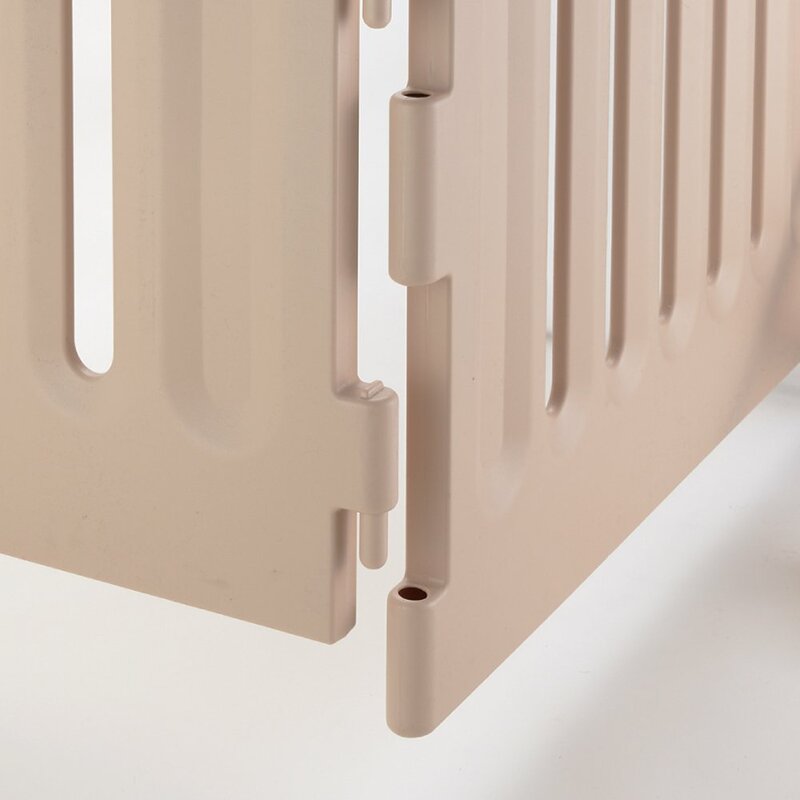 Richell Playpen is 3-in-one and that’s the beauty, which means you can use it as a playpen, free standing gate or a room divider. That’s the reason many dog owners love it. I know many people who own it. And, there is a obvious reason why it is an ‘Amazon Choice’ product. There are many reasons why Richell Convertible High Pet Playpen ranks better than any other playpens. Please read on to find out more. The product is available in four panel or six-panel configurations. You can choose the one which best meet your needs. But, the great thing about the six-panel playpen is that you can orient the design in either hexagonal or rectangular shape. The hexagonal shape gives almost a circular perimeter for your pet to play. The rectangular construction gives lengthy play area with moderate width. Rectangular construction will provide your pet ample space to move around. Do not worry about the playpen losing its shape when your pet starts to hit the panel walls. Because Richell Convertible High Pet Playpen comes with lockable tops. It is adjustable to 90°, 180° or 270°. Therefore locking the shape comes with no effort. I feel that’s a real advantage of Richell Playpen. Rearranging the panels are super easy as the product uses unique hinges that let you remove and add panels with ease (as shown in the image above). Why not use it as a room divider? What if you don’t want your pet to enter a specific room in your home? You can’t always keep an eye on your pets as dogs and cats are incredibly sneaky, right. The moment you take your eyes off them, you can expect a mess followed by even greater mess. This is why you should use Richell Convertible Playpen as a room divider like shown above. Setting the panels in a zig-zag manner, you will have a custom room divider. Now you can partition rooms or open spaces in your house to create a pet-proof area. You don’t have to worry about them jumping over the walls because it’s high enough. Richell Convertible High Pet Playpen has smooth corners. You don’t have to worry about your pet getting injured if it tries to climb the panels or accidentally scrape themselves on it. You can cross the divider using the gate door. It is a small built-in lockable door that enables you and your dog to pass through the panels without any hassle. When you use the playpen as a room divider position, it measures 132 inches in length. No matter how large the room is, it gives you the freedom to divide the room into partitions. The good thing about Richell Playpen is that it is very easy to clean and maintain. Because it is convertible there is no problem moving it around your home. You can easily use it outdoors as well because it is water resistant. What if you want to extend it? Yes it is possible to attach more panels, or attach two units. Please refer to the user manual provided by the manufacturer. But, if I was you I will buy one first and see how it goes before I invest on another one. What if you don’t want your pet to come to a certain room or area? You can’t let them sit behind a closed door. Richell Convertible High Playpen has the answer as you can use the playpen as a pet gate. One of the panels has a small gate that you can open if you want your pet to enter that area. This is very useful if you want to enter the same room. You can use the gate door to pass through, and your pet will remain in the confined safe area you want it to be. (1) Check out the gates/doors once the product arrives. If you think they are not sturdy enough for your needs contact customer service because you can return the item if you are not fully satisfied. As you know Amazon is awesome. (2) There were few complaints about the sturdiness of the door latch. But, as I said before that’s something you need to inspect and monitor as soon as the product arrives. As you have seen, the possibilities are endless with Richell Playpen (Convertible). It is definitely a good playpen. But, we also need to bear in mind that nothing is perfect. You have your favorite pet and you want them to have a secured play area, so they stay safe and at the same time not mess around, then you should definitely consider buying a Richell Convertible High Playpen.